JUSTICE LEAGUE #32Written by GEOFF JOHNSArt and cover by IVAN REIS and JOE PRADODC Collectibles Bombshells variant cover by ANT LUCIA1:25 Variant cover by HOWARD PORTEROn sale JUNE 18 • 32 pg, FC, $3.99 US • RATED TCombo pack edition: $4.99 USRetailers: This issue will ship with four covers. Please see the order form for details.Lex Luthor continues his acclimation to his life as a one of the world's greatest heroes as they search for the mysterious power threatening to unravel our world. But are his sights really set on the Dark Knight? And are the Dark Knight's set on him?Plus, someone else is targeting Luthor and his new allies – a man who believes himself Luthor’s superior in every way...and maybe he is! Here comes The Chief and his treacherous Doom Patrol to The New 52!This issue is also offered as a combo pack edition with a redemption code for a digital download of this issue. 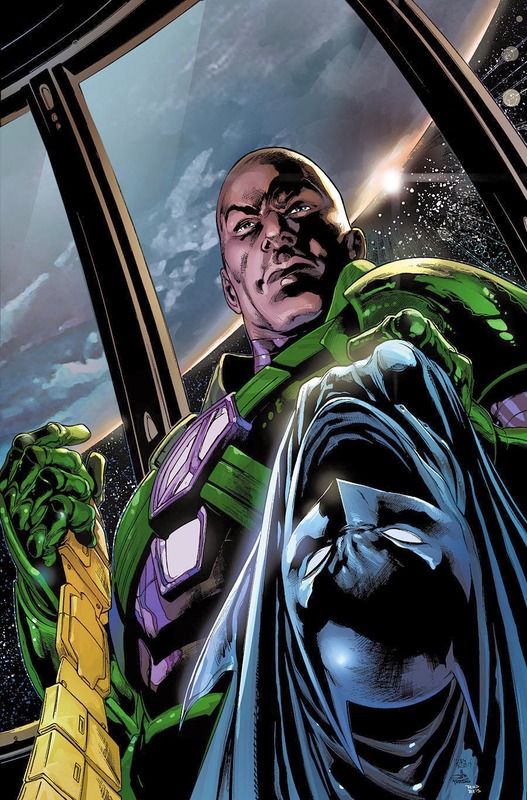 The Chief vs. Lex Luthor in a battle of the brains?! GAME ON!! I'm not so sure about the treacherous Doom Patrol, but I do supposed it would fit in with the darker and grittier DCU. We've seen a few of the second/third generation Doom Patrol characters so far, including Karma and Scorch. We've even seen glimpses of Celsius and Negative Woman. I'm looking forward to what Reis and Prado have in store for the rest of the DP this June. Rebooting the Doom Patrol via the Justice League? Somewhere John Byrne is rolling his eyes and saying, "Yeah, good luck with that...". I find more consolation knowing that Geoff Johns is writing it. His take on the team in the Teen Titans circa "Infinite Crisis" probably should have led to more and sooner. The Giffen series was probably my favorite since Morrison but I would love to see what Johns would do with them without the albatross of New52! around his neck. Having to perpetually polish this post-Flashpoint turd is certainly "above and beyond" for somebody with his CV. Having Reis as a penciller must make it easier. Come to think of it, since they were brought back into mainstream continuity about fifteen years ago the Doom Patrol have always been drawn well even when they suffered from arbitrary and misguided editorial directives. It will be well worth seeing in any event. I just discovered this blog, it's great to find a site owned by someone who's as fond of the Doom Patrol as I am. This is a well-organised, dedicated site! I'm optimistic about the New 52 Patrol. Giffen's run looked neat, but I found the dialogue severely lacking, especially with Larry. I'm hoping Grant Morrison's Omnibus coming out soon along with a New 52 run will revive interest among the comic book community. Again, great blog, keep it up! I'm all for the Doom Patrol being more involved in the mainstream DCU, even if it's the NU52 DCU. I'm curious just what a devious DP will look and act like, but the Chief's always been that devious anyways. Wow. Welcome aboard, Ryan and Dale!